Once there's a reason it makes more sense. I feel ill, that’s why I can’t find any umphh, I’m sneezing and gasping for breath at the slightest thing and dizzy if I stand up too fast and my sinus’ are ever so slightly pressured. I feel better just knowing that there’s a reason for feeling rubbish and that I’m not just being a lazy so and so. As a result I’m not going to go to Manchester tomorrow as I was planning, I was going to visit two groups of uni friends, Caroline and Graeme -Hi Graeme I know you read this- and Emma and Mark and their new baby Emily who the big jug is for. Anyway I’m not really fit to travel being as walking across the yard to the barn had me coughing and wheezing, how rubbish is that, and I certainly don’t want to pass my bugs on to the wain. So I slowly did a few bits of things today, glazed the pots that I had bisque fired though one of my big tree platters has cracked –arghh! I do hate that. Packed the kiln with a big bowl on the top that I am re-firing with some more glaze on the outside as it came out looking a bit thin. Not sure if that will work, I had to blast it with the heat gun to get it to dry off. We’ll see what happens. 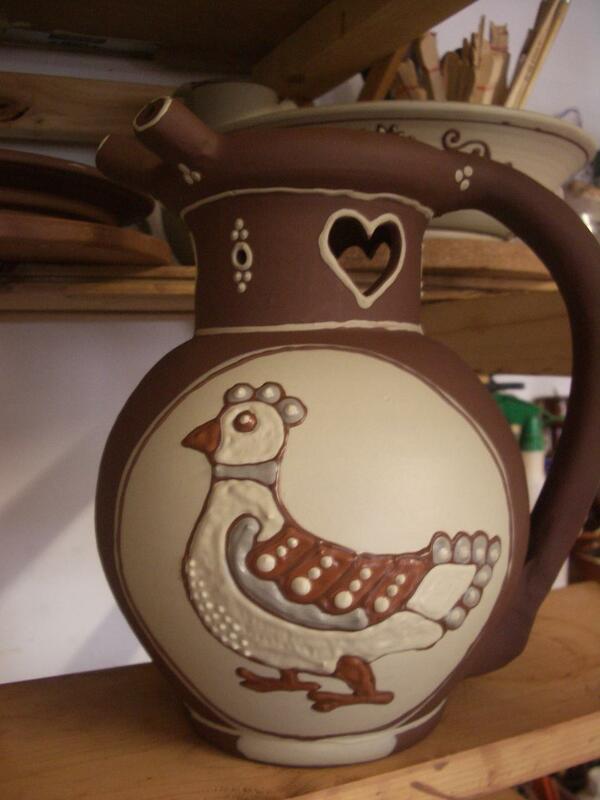 This puzzle jug is a commission, it has another fat bird on the other side. 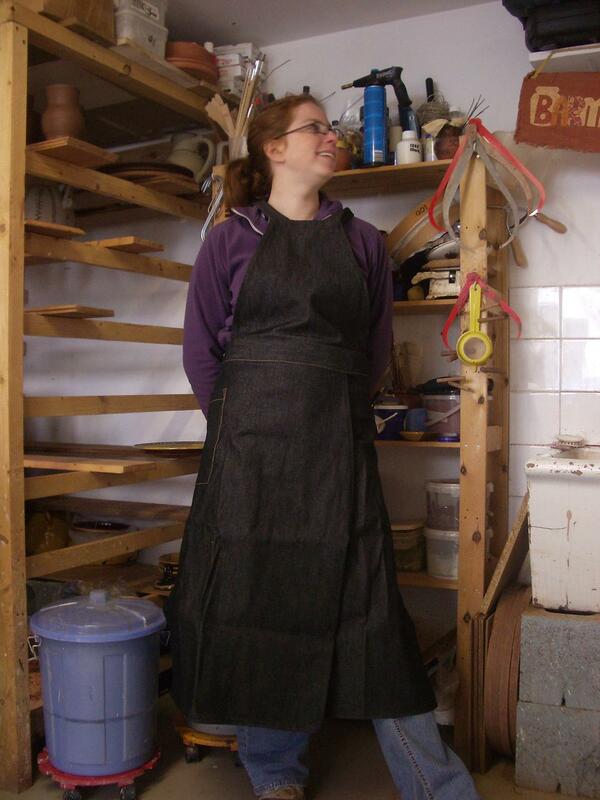 This is my exciting new piece of work attire, I got it at Potfest though I’ve been meaning to get one for ages. I was asked by someone at Christmas last year what I would like for a present and I asked for one of these but received a Bagpus hot water bottle cover instead. Useful in it’s own manner and good when you feel poorly but for keeping the slip at bay in the workshop not quite so successful. 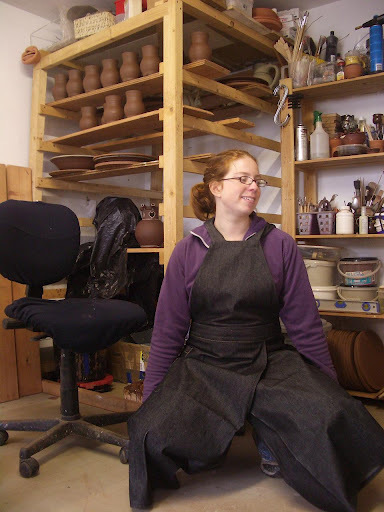 These are made by the lovely Laura Wright, wife of David Wright who makes some great hand built wood fired pots. I’ll put a picture up ofthe lovely tea bowl I swapped with him at the weekend at some point too. It splits really well when you crouch down or get on the wheel and I should have taken a pic of the back too as it will fit a myriad of differently sized people. As you can tell I didn’t ever have ballet lessons but this is my mug slipping position. It’ll be a much better apron in a couple of days once I’ve covered it in red clay and slip, it’s far too clean and neat at the moment. Well that’s me for tonight, off for a hot toddy and a bit of a rest. Word of the day today is very approprite: enervate. This entry was posted in apron, fat birds, Harvest jugs. Bookmark the permalink. 4 Responses to Once there's a reason it makes more sense. Lovely apron daarrrling. (That’s to be said with a Southern US accent like Scarlet O’hara)Nice jug with the tree too. I failed miserably at making any decent jugs today. Ended up scrapping all but one. Oh well maybe tomorrow. I hope you get to feeling better. I can only say sorry about my motivation speech yesterday! Now I know you’ve come down with something. Like the new frock, very fetching. PS, I can’t thank you enough for the Tea bowl but am going to have a go on my blog. Sorry you feel under the weather. Going to see friends when you have a cold AND see a baby, too???? Hmmm…sharing, even a cold..it’s what being a friend is all about! :)Don’t mean to pick when you are down. ;)Awesome bird. Ever done any painting? You should consider it. 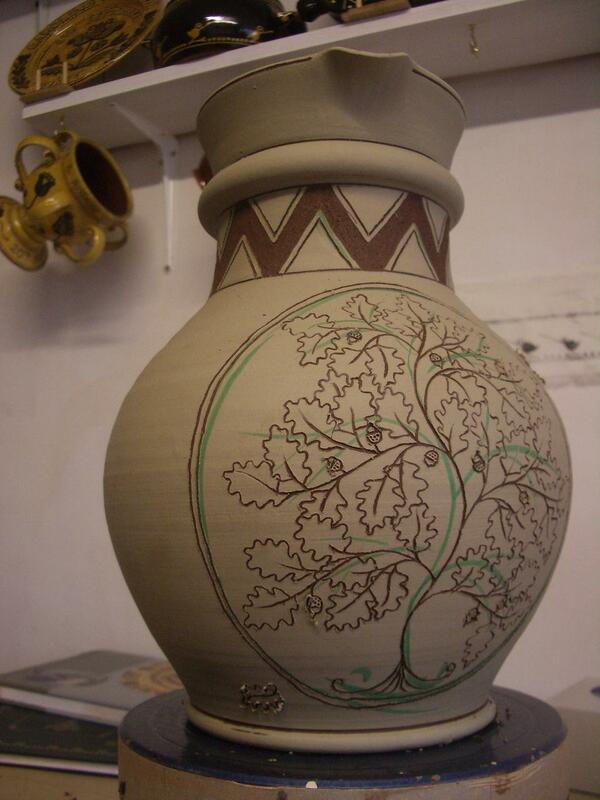 Can you paint a pot before glazing it? Just a thought. Painting! Sends streams of terror through me, see todays post about drawing! I’ve done odd bits and I mean odd! bits but it’s not something I’m hugely comforatbel with. Yes you could paint with under-glazes or oxides, Alan does some with oxides I think, he’ll certainly correct me if I’m wrong of that I have no doubt.